Hello Over the Big Moon friends! I’m so happy to be here again. If you missed my post last month, I’m Rebekah from Charming Imperfections, a blog where everything is beautifully flawed. I love doing DIY projects when my rambunctious toddler is napping. 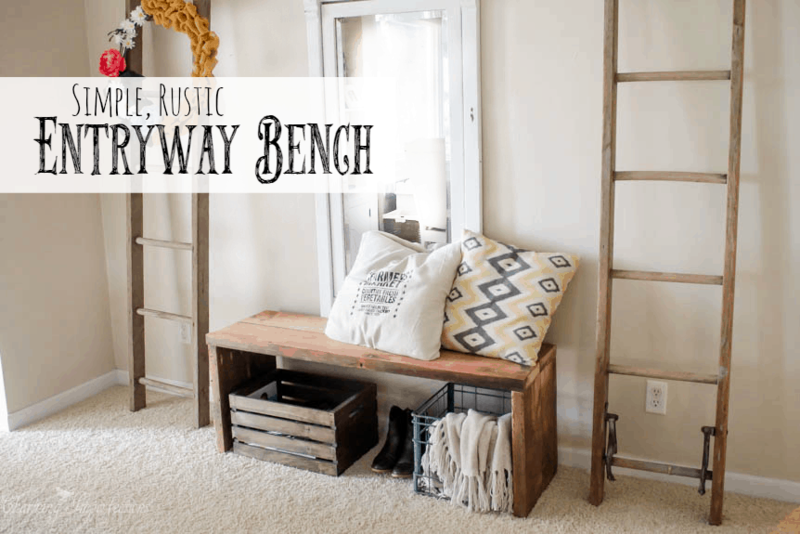 Today I am sharing with you a Simple DIY Bench! Now, there is a funny thing about storage spaces that I pondered as I worked on this project. Alone basket on the floor is not usually acceptable as a storage solution, however, a basket on the floor under a bench is cute and functional. We needed some entry way storage and, though we had plenty of baskets and crates, the space needed something more, so I decided to build a bench. This project was so easy that I can say with confidence: just about anyone could do it! 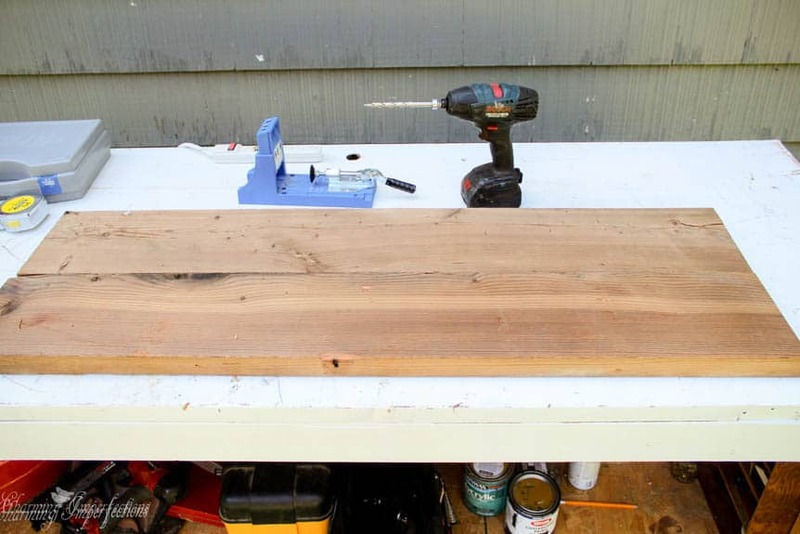 So, let’s get out the power tools for an amazingly simple DIY bench. First, make your cuts. The 8 foot 2×8 gets sawed perfectly in half. It’s a good idea to measure the length of the board and divide that in half rather than just cutting at 4 foot for accuracy. Since I was using reclaimed wood, everything had to be measured. Next cut the “legs” from the 6 foot 2×8 by measuring out four 17” pieces. 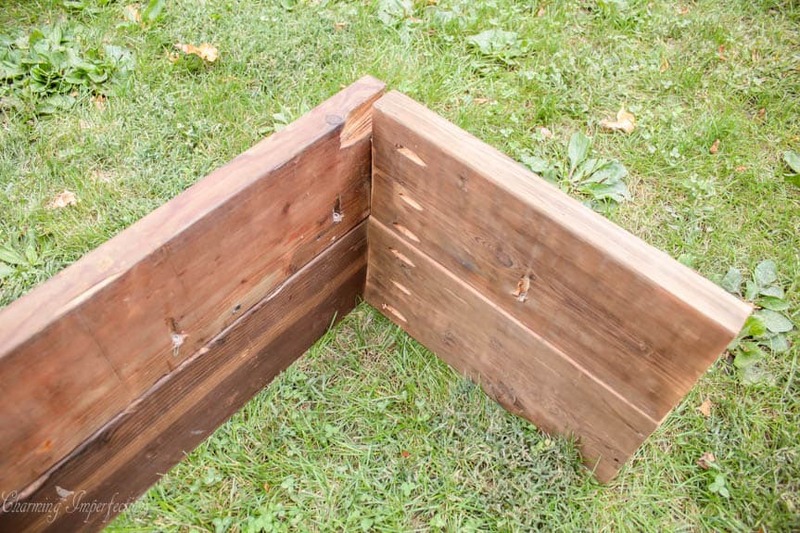 Now, get out your Kreg Jig for the pocket holes. If you don’t have one of these nifty tools, I’ll explain how to attach the legs further down in the post. Drill the pocket holes about 8 inches apart on one of the “seat” boards down the long side that will be connecting with the other board. Then drill pocket holes into the top of the legs. I did three each, but that was probably overkill. Two would be sufficient. I also drilled one towards the middle to join the boards together. Now is a good time to do any sanding. Connect the seat boards using wood glue and 2” screws. Do the same for the legs. Now you are ready to screw the legs on. 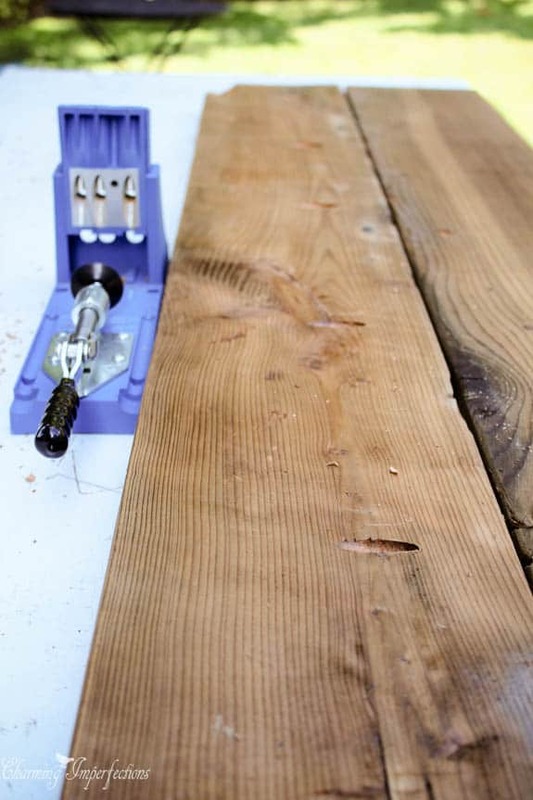 If you don’t have a Kreg Jig, you’ll have to go in from the top of the seat with 2 ½” screws. 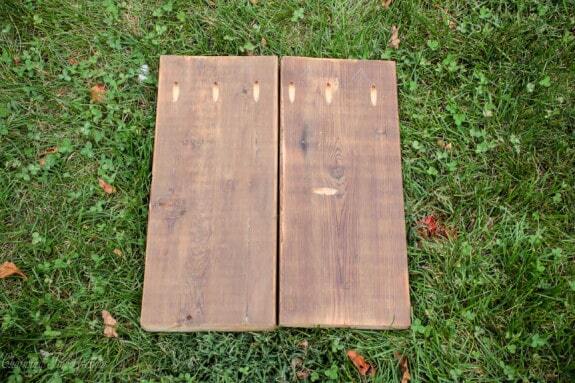 If you do have a Kreg jig, you’ll be going in from the underside where the holes are less visible. Finally, you are ready to stain! 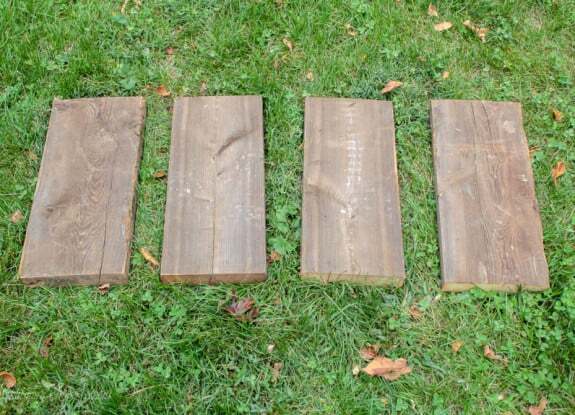 I actually didn’t do this because the reclaimed wood was beautiful as it was, but it’s totally a preference thing. It might also be a good idea to seal it with polyurethane after the stain is dry. 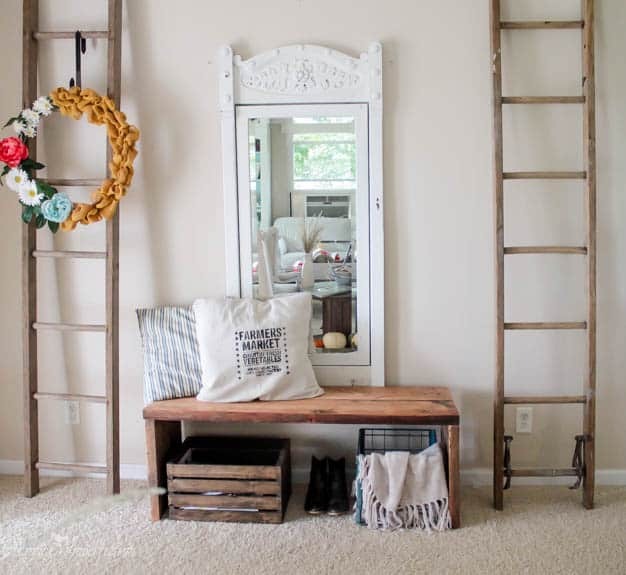 Now, you have a very simple, but very pretty storage solution for an entry way. 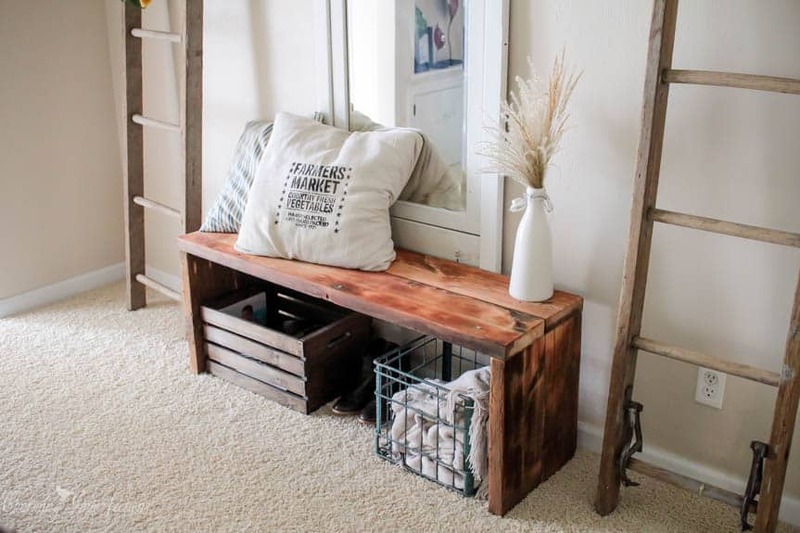 A lone basket on the ground wouldn’t do for storage, but a basket underneath a lovely bench like this one was the perfect solution for our entry and could be for yours as well! 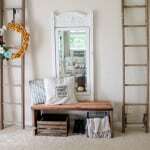 Check out Charming Imperfections for more practical, budget friendly tutorials like this one! If you love this project, I’d appreciate it if you pinned the image below! Thanks so much! Hi, I’m Rebekah and I blog at www.charmingimperfections.com! I’m a young Mom that lives in the middle of cornfields. Growing up as a handyman’s daughter, I’m enthusiastic about all things DIY and love to fix, create, and build just about anything. Charming Imperfections is the blog where I share DIY tutorials, parenting tips, and how to live a beautifully flawed life. Love, love, love all of your Creations! They are amazing. Keep them coming! You’re so nice!! Thanks so much! 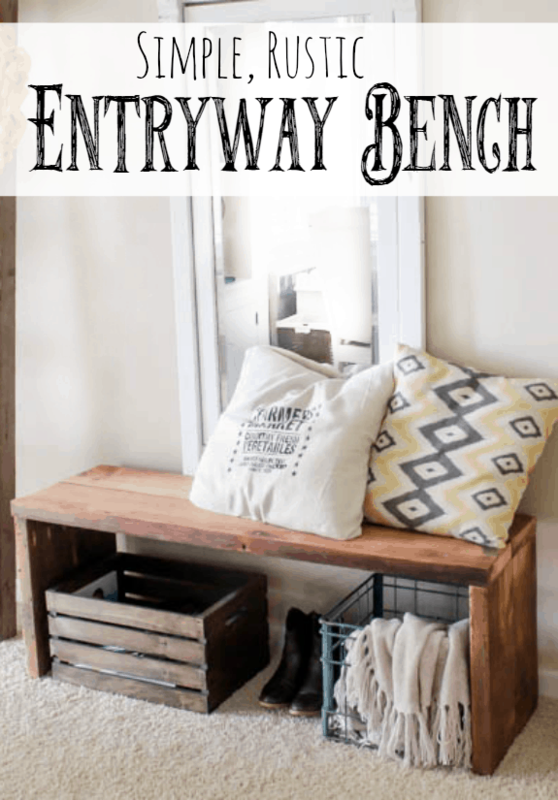 Such a cute bench and the perfect project for someone using their Kreg jig for the first time! I have been looking to buy entryway benches, but they are so expensive! Thanks for this easy and cool tutorial. I love rustic so this would be in my list of projects. I LOVE this bench. So simple and rustic. Perfect for my home. Thanks Annette! It would look in almost any home, right? This is great! I need a bench so it looks like I’ll be adding this to the Honey Do list. I love this! Thanks for the step by step pictures. They really help! This is so awesome even I could do it! I’m not crafty at all and she makes it look so simple. We are building a house right now and I’m getting ideas of how to decorate. Definitely going to save this one for later so I can make it for my house when it is done! This is so cool! I totally admire chicks who can make projects like this come to life! Bravo! Thank you Laura! Sometimes you have to just take control and learn to use your power tools, right? This bench is so beautiful. And it looks easy enough I may be able to do it myself!